Federal officials and an executive from automotive supplier Takata took turns Tuesday explaining to Congress why it took years before any of them took action to protect motorists from a deadly airbag defect and why the safety problem still threatens drivers. Their testimony before the Senate Commerce Committee came one day after the release of two reports that detailed serious lapses in how both approached their investigations of the problem. One of the reports, issued by the committee in advance of Tuesday's hearings, said internal emails showed Takata stopped performing internal safety audits to save money just as the scope of the crisis was growing. Another report, issued by the Transportation Department's inspector general, found critical deficiencies in how the federal agency charged with protecting motorists failed at its job. 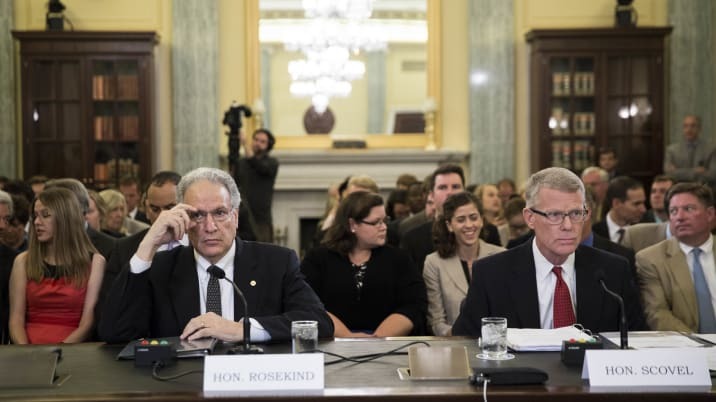 Several senators criticized the National Highway Traffic Safety Administration's years-long response to the airbag defect, which is responsible for the deaths of at least eight motorists in the United States at latest count. Even as NHTSA administrator Mark Rosekind pleaded for more investigative staffing, Sen. Claire McCaskill (D-Missouri) said she was reluctant to support that request until the agency cleaned up its act. "This audit report is one of the worst I've ever seen," she said. "It's not about resources, it's about blatant, incompetent mismanagement." Citing a portion of the report that noted employees in the agency's Office of Defects Investigation could not agree on a standard of when an investigation into a safety defect should be opened, McCaskill said, "If NHTSA isn't clear on when an investigation should be open, we might as well shut it down." Takata has recalled approximately 34 million vehicles because their airbags can potentially explode and shower vehicle occupants with jagged chunks of metal shrapnel instead of deploying normally in a car accident. Sen. Bill Nelson (D-Florida) recounted the catastrophic consequences of these defects Tuesday, saying an Orlando-area Takata victim had her throat slashed so badly, police initially thought they were investigating a homicide when they arrived on the scene. Eleven major car companies have been affected by the recalls. Though problems with the airbags were first identified in 2001 and the first of dozens of related recalls was issued in 2004, Takata executive vice president Kevin Kennedy told members of the Senate committee Tuesday that identifying the source of the defect remains a vexing process with no clear-cut answer. The bat-wing design of the inflators, manufacturing process defects, high humidity, and the controversial use of ammonium nitrate in some inflators all were identified as possible culprits. Kennedy told Congress the company has stopped using the bat-wing inflators, but that ammonium nitrate remains a component in some airbags still being produced and put into new cars today. Asked why the company filed a patent in 2006 on an alternate inflator design and why desiccant, a substance that can absorb humidity, was added to many airbags in 2007 or 2008, Kennedy said it was part of the process of continuous improvement of the product. But Sen. Richard Blumenthal (D-Connecticut) wasn't buying that explanation. He told Kennedy "continuous improvement sounds like a euphemism for 'trying to avoid exploding airbags.'" During the testimony, Nelson held up photographs of a fire at Takata's manufacturing plant in Monclova, Mexico, that was linked to the improper storage of propellant scrap, which included ammonium nitrate. He asked Kennedy whether those were the types of concerns that safety audits would have revealed. Although Kennedy answered in the affirmative, he said the report "misrepresents" the types of safety and quality audits that were canceled. Rosekind made no such claims on the content of the inspector general's harsh report examining NHTSA. On Tuesday, DOT inspector general Calvin Scovel told Congress that NHTSA lacks procedures to ensure accurate data is collected, that information collected from consumers is too ambiguous, and that the Office of Defects Investigation doesn't follow standard statistical practices. He recommended 17 particular areas where NHTSA could improve, and Rosekind said he intends to implement all the recommendations. Members of Congress drew parallels between NHTSA's failure to recall the deadly airbags and the agency's years-long failures to thwart a deadly General Motors ignition switch defect that at last count was responsible for killing 117 motorists and injuring more than 200 others. Though the number of deaths caused by the Takata airbags is far smaller, Blumenthal said he suspects it will grow. He noted that for several months, GM insisted only 13 motorists had been killed in accidents caused by the ignition-switch defect. "The number of deaths reported so far is eight, and I feel like that number is a lot like 13," Blumenthal said. This may be the "tiny, fractional tip of the iceberg of death caused by these airbags, and I feel like the record of cover-up and concealment is one of the low points in corporate conduct."